The baseball card world shrank significantly in 1956 as Bowman stopped producing a regular set and many of the smaller card producers also ceased production of their specialty releases. This allowed Topps to reign supreme over the trading card industry and it would continue for decades to come. This top lists examines the complete landscape of baseball cards in 1956 with an examination of the key trading card releases and the overall top cards produced. Shop for Professionally Graded 1956 Baseball Cards on eBay. Although 1955 Bowman proved to be the last set released by the brand for many decades, Bowman did create prototypes of a potential 1956 series that was destined to never to be released. Only a few examples have survived and, unfortunately, collectors are more likely to find these cards in a museum than in their own hands. Losing Bowman as a main competitor didn't spur any new creativity to the 1956 Topps flagship set as the horizontal design was very similar to the 1955 set configuration. Each card has both a close-up portrait and an action shot that each feature painted photographs. A new addition to the 1956 set was a team card for every squad along with an individual card for the league presidents. Also, cards #1-#180 can be found printed on gray or white cardboard, with a premium placed on either version at different points in the checklist. Outside the key flagship set, Topps released two other baseball-related sets. The first being a continuation of the Hocus Pocus series featuring invisible player photos that fans could develop by getting the card wet and placing it in direct light. Typically, gimmick cards like this would hold a value if they were "unused" but Hocus Pocus cards that have been completely developed also hold a premium. The Ted Williams and Jackie Robinson Hocus Pocus cards top the list of options. Topps also issued a 60-pin set featuring the portraits used from the 1956 Topps flagship set. Collectors could buy a pin and some bubble gum for five cents each. 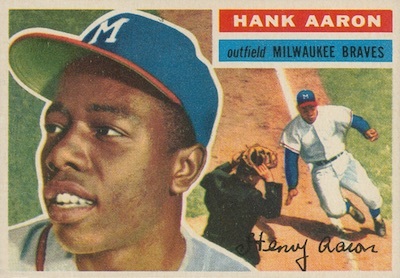 Over time, it has been shown some pins were severely short-printed, and, with those excluded, the overall high value pin is Hank Aaron. Another choice outside of standard cards, Big League, Inc. produced baseball player statues in 1956. The card that the statues were attached to were basically oversized trading cards with statistics on the back. The most valuable statues with or without the cards are Mickey Mantle, Stan Musial and Yogi Berra. While Topps was the big fish in a very small pond in 1956, several company continued to create trading cards for their local teams. Kahn's Wieners included Cincinnati Reds players in their hot dogs, with the highlight being an early Frank Robinson card. Carling Black Label Beer issued a set of Cleveland Indians players on photocards with Bob Feller's card having the most value. Rodeo Meats issued a Kansas City Athletics team set featuring Hall of Fame members Lou Boudreau and Enos Slaughter. A few MLB teams even got into the card-producing game as the Brooklyn Dodgers, New York Yankees, and Cleveland Indians issued photocard sets of their players. 1956 also saw a rare non-American baseball card release produced in Cuba that featured the greats of Cuban baseball at the time. Released over two years and termed Chicle Peloteros, this Spanish-language set includes one of the few Silvio Garcia cards. Garcia was a double threat as both a pitcher and a shortstop and he was in failed negotiations with the Dodgers to break the color barrier a year before Jackie Robinson did. As Topps had little competition in the baseball card market, when formulating this top list it was difficult to justify including a card that wasn't part of the Topps 1956 set. While some of the other cards made also have notable value, they are often too scarce for collectors to find on a regular basis. The Topps set remains not only very popular but the value of the cards continue to be strong. Click on the images or listings to shop for specific cards on eBay. Looking back, the rookies debuting in 1956 were nowhere near as remarkable as those in 1955 and 1957. 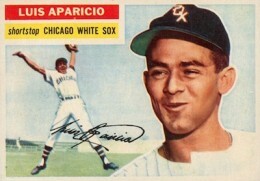 The only key Hall of Fame rookie card belongs to Chicago White Sox shortstop Luis Aparicio. Other fan-favorite rookie cards in the 1956 Topps set include Roger Craig, Herb Score, and Dodgers manager Walter Alston. 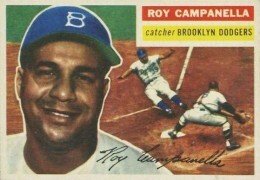 Roy Campanella returned to a Topps card in 1956 after being featured only in the Bowman set in the previous two years. Campanella was coming off his third MVP season in 1956 and was one of the most beloved players in the league for his team play and hard work. Through his guidance, the Dodgers were able to get back to the World Series again, ultimately losing to the Yankees in seven games. 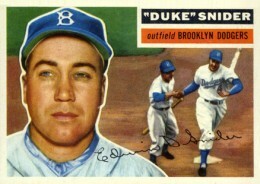 Duke Snider falls on the 1956 Topps checklist where his cards can be found with either a gray or white backs. The portrait of Snider is the same between his 1955 and 1956 cards, but the action pose has Snider crossing the plate, presumably after hitting a home run. This is appropriate as Snider led the National League in home runs in '56 with 43 dingers. Sandy Koufax had one of the top rookie cards in the 1955 Topps set and his 1956 Topps card is certainly one of the most beautifully composed. 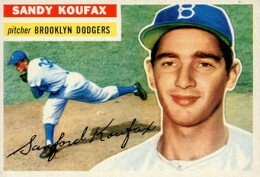 Although Topps notoriously repeated images between the '55 and '56 sets, Koufax has two original images including an action shot of him hurling a strike. 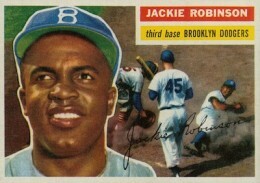 Jackie Robinson's 1956 Topps card would prove to be his final card as a player as he retired as the 1956 season due to the effects of diabetes. Robinson only had five Topps cards spread throughout his years in the league, making his small number of baseball card appearances some of the most sought-after by collectors wanting to not only own important baseball cards, but a piece of history as well. 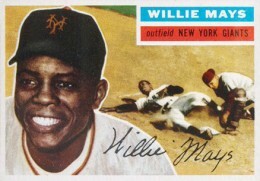 Although Willie Mays had an off-year compared to his two previous amazing seasons, he did lead the league in stolen bases. Appropriately enough, he appears to be successfully stealing home on the front of his '56 Topps card and the reverse side has a cartoon in honor of Mays' legendary World Series over-the-shoulder catch that cemented his legacy. Even though Ted Williams' 1956 Topps card has a strong resemblance to his 1955 Topps card, the demand for the Splendid Splinter's cards still make this one of the most valuable cards produced in 1956. 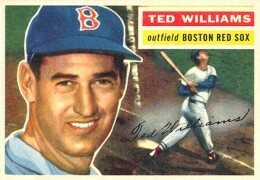 This popularity is undoubtedly helped by the actions portrayed on a cartoon on the reverse side of Williams' card which has him signing autographs for a large group of fans. Roberto Clemente's rookie card held the first spot on our list of the top cards from 1955 and his second-year card is still a strong performer the following year. 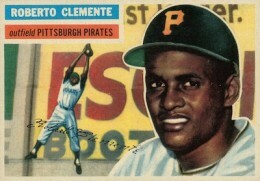 The reverse side of his '56 card tells the story of Clemente originally being signed by the Dodgers to a minor league deal and then being drafted by the Pirates in 1955. Famously, the action shot on Hank Aaron's 1956 Topps card is actually Willie Mays sliding at home. That oddity, along with Hank Aaron's historic career, has made this one of the most popular Aaron cards and also puts it amongst the top cards produced during the entire year. Mickey Mantle was absent from the Topps set in 1954 and 1955, so Topps was understandably eager to get the biggest star in the league back into their flagship set. 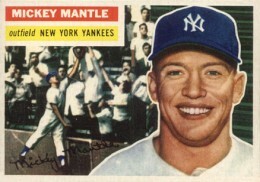 Mantle's card blows away every other card made that year in terms of value. Adding to that, the fact that you can find two versions (white or gray backs) of his card only helps to drive up the demand for this historic card. Cards graded at near-mint condition can regularly reach prices above $7,000 at auction. 1961 Mickey Mantle Topps MVP (1956-57) #475 PSA 7. Very Nice Vintage Card!